October 30, 2013 By Allyson 9 Comments This post may contain affiliate links. Read my disclosure policy. 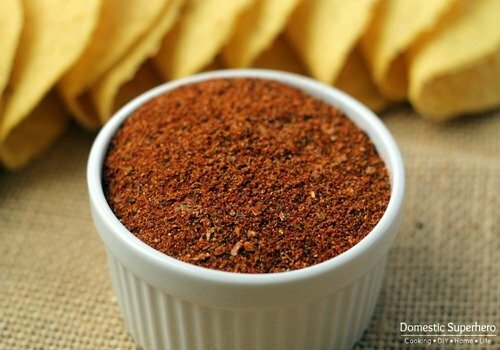 Taco seasoning is one of those things that is used all the time, but do you really know what’s in it? Seasoning packets add a lot of extra salt, empty calories, and mystery ingredients. When you seasoning dishes yourself it doesn’t lock you into one flavor, but allows you to adjust the flavor of the dish to your taste. If you like things spicy, add more chili powder, if you like things milder, take some away. You may think that making it yourself is difficult, but it’s not. In fact, it’s very easy and will save you a ton of money in the long run! To make your dollar stretch the furthest possible, buy spices from a bulk bin, or spice store. They often have great deals and can be found for a $1 or less per bottle. I have also been able to find great, inexpensive spices at Aldi, the Natural Food Warehouse, and Indian Markets. 1. In a small bowl mix everything together. Store in an airtight container. Makes 10 servings. About 2.5 TBS equals one packet. I wanted to share this tried and true recipe with you, so you can make your spices at home, and keep you and your family healthy! I hope y’all like it as much as we do! I really love tacos, so this is something I will be keeping 🙂 thanks Allyson! Stopping by from the Weekend re-Treat link party! Thank you for posting this! Thank you for reminding me that one of my goals next year is to have a pantry FULL of DIY mixes! I hate spending money on packets of spices or pre-made mixea. 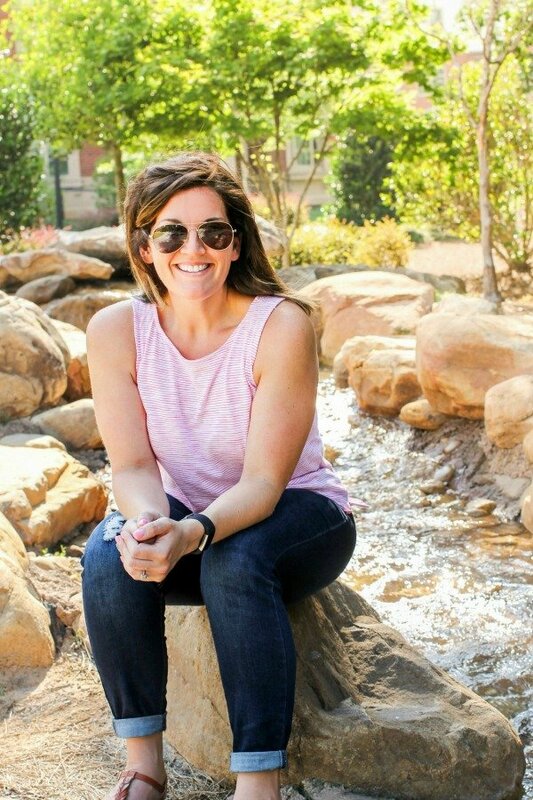 You have inspired me to start setting my plan in motion to start at the beginning of the year! 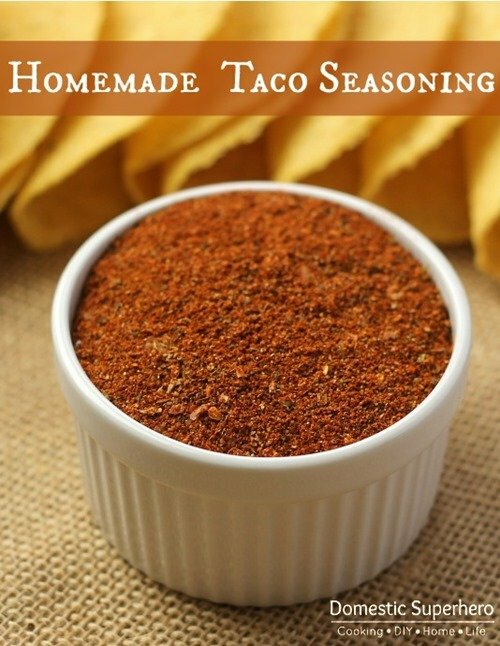 We love making our own homemade taco seasoning too and I honestly think it tastes better than the packet stuff. Thanks for sharing on the weekend re-Treat link party. Hi there! This mix looks delicious! I was wondering, when you buy the taco packets, it seems like they have some sort of thickening agent added. You know how they have you add the water to the ground beef and then the taco packet and simmer it for a little while? Have you ever added something to make it more saucy? I saw a Pioneer Woman episode where she used her own spice blend like this one and then added HOT water from a tea kettle to make the taco meat more saucy. Haven’t tried it yet myself, but it’s worth a shot. Those thickening agents in the store-bought seasonings add a hefty dose of CARBS. For a diabetic like myself, the minimal amount of carbs in these homemade blends sure beats the 18 carbs in the packet!